A majority of objects universally are colored by pigments, but using pigments has drawbacks: industrial pigments are mostly toxic, colors can fade, and certain color effects are difficult to achieve. The natural world, however, also displays structural coloration, where the microstructure of an object causes several colors to appear. Peacock feathers, for example, are pigmented brown, but - due to long hollows within the feathers - reflect the stunning, iridescent greens and blues one sees and admires. 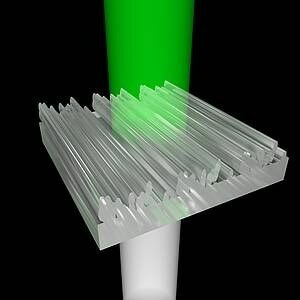 Latest advances in technology have made it practical to fabricate the kind of nanostructures that lead to structural coloration, and computer scientists from the Institute of Science and Technology Austria (IST Austria) and the King Abdullah University of Science and Technology (KAUST) have currently developed a computational tool that automatically forms 3D-print templates for nanostructures that match user-defined colors. Their research shows the significant potential for structural coloring in industry, and paves the way for possibilities for non-experts to develop their own designs. This project will be presented at the top computer graphics conference, SIGGRAPH 2018, by first author and IST Austria postdoc Thomas Auzinger. This is one of five IST Austria presentations at the conference this year. The varying colors of a chameleon and the iridescent greens and blues of the morpho butterfly, among many others in nature, are due to structural coloration, where nanostructures cause interference effects in light, resulting in a range of colors when seen macroscopically. Structural coloration has certain benefits over coloring with pigments (where specific wavelengths are absorbed), but until recently, the boundaries of technology meant fabricating such nanostructures required extremely specialized techniques. New “direct laser writing” arrangements, however, cost about as much as a top-quality industrial 3D printer, and allow for printing at the scale of hundreds of nanometers (hundred to thousand time thinner than a human hair), paving the way for scientists to try out structural coloration. Second, the nanostructures in the template do not adhere to a specific pattern or have a standard structure; they appear to be haphazardly composed—a fundamental break from earlier approaches, but one with a number of advantages. “When looking at the template produced by the computer I cannot tell by the structure alone, if I see a pattern for blue or red or green,” explains Auzinger. “But that means the computer is finding solutions that we, as humans, could not. This free-form structure is extremely powerful: it allows for greater flexibility and opens up possibilities for additional coloring effects.” For example, their design tool can be used to print a square that looks like red from one angle, and blue from another (termed as directional coloring).